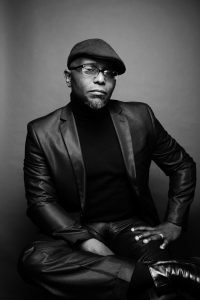 This evening, Tuesday, Jan. 30 at 7pm, Tyehimba Jess will give a reading and a talk at the Connolly Center as part of the annual Lit Fest. Jess hails from Detroit and has a BA in public policy from the University of Chicago as well as an MFA from New York University. An associate professor of poetry and fiction at CUNY: Staten Island, Jess has also found the time to publish two acclaimed poetry collections and appear on such prestigious broadcasts as NPR and TED. I personally admire Jess’ impassioned and matter-of-fact style of speaking as well as his ability to talk about complex social and literary issues in a clear and approachable way. Don’t just take my word for it though! Take a look at the the resources assembled below and be sure to confirm your opinion by seeing Jess here on campus tonight! Jess poses for a portrait. More information on his event available here.